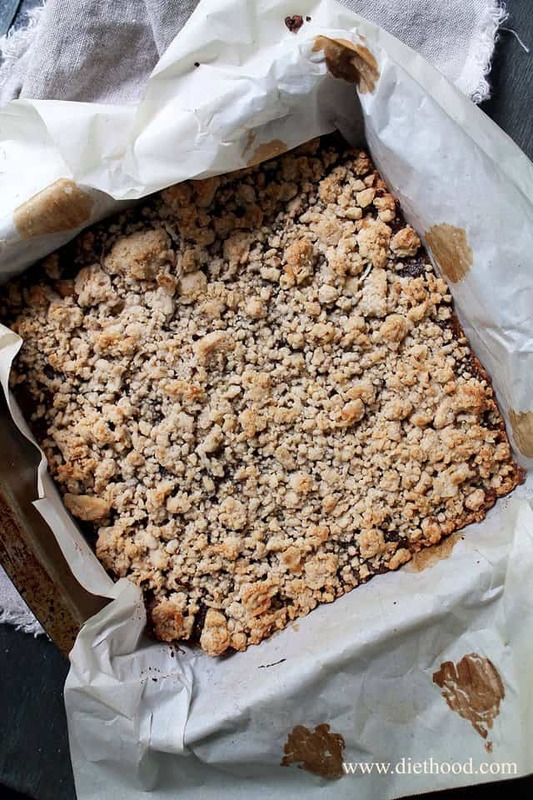 Nuts, oats, and shredded coconut granola crust, filled with a delicious fig jam. I was just thinking… Autumn starts in like 2 days, right? Right. So. You know those few pounds that you fought to lose only about 3 months ago to fit into that bikini? Yeah, those. If you are anything like me, and I have a feeling that you are, those elbees are about to come back. It won’t be with these Fig Jam Bars. Oh no. These are borderline healthy. But, it will be done with things such as these Sweet Potato Ginger Snap Cookie Trifles or my delicious Caramel Apple Spice Cake! YAY FALL! WE MISSED YOU!! I love the months between September and January because I get to bake and cook, and cook and bake… Something about this season inspires most of us to bake and of course, eat! I’m also looking forward to wearing comfortable oversized hoodies and yoga pants. All.the.time. The fashion police is gonna love me! In other news, we are preparing to move into our new house. Little by little, we’re getting there. I’m not sure exactly when we will start to move in, but I hope it’s before the credit card bills get here. I kinda spent a teeny bit too much on our furniture. The hubs doesn’t know…yet. BUT, I have a plan. If the furniture arrives before the bill, he won’t have a heart attack because he is going to fall in love with everything and soften up by the time that bill gets here. IF the bill comes before the furniture… well, then, Lord help me. I hope that he will at least appreciate the king size bed I got. I’m 5’6 and fit into a twin, comfortably, but it’s him and his 6’3-self that needs the bigger bed. That’s my argument right there… I did it all for you, honey! I used the last of my mother’s fig jam in here, but you can use any jam you fancy. Personally, I think they would be just as delicious with some raspberry jam, or any other berry jam. 1 stick butter , softened, cut into 10 pieces. Line a 8x8 pan with parchment paper, leaving a 2-inch overhang on the sides; set aside. In a mixing bowl, whisk together flour, pecans, oats, sugar, shredded coconut, cinnamon and salt. Cut in butter and work mixture into small crumbs. You can also do this with a fork or even your fingers. Add honey and using your hands, continue to work the mixture until thoroughly combined. Transfer two-thirds of mixture to prepared pan and press it down, covering the entire bottom of the pan. Bake for 25 to 30 minutes, or until crust is light brown. Remove from oven and spread the fig jam across the top. Sprinkle the reserved granola mixture evenly over the jam. Bake for 35 to 40 minutes, or until golden brown. I looooove your recipe and I would like to make it this weekend. However my other half doesnt like coconut, so could you please suggest something else to add instead of it? or if I completely remove it from the recipe should I use less of other ingredients? These were so good, and I’m so happy I found your blog! I didn’t see when you were supposed to add the brown sugar, so I put it in right before the butter, and that worked out. 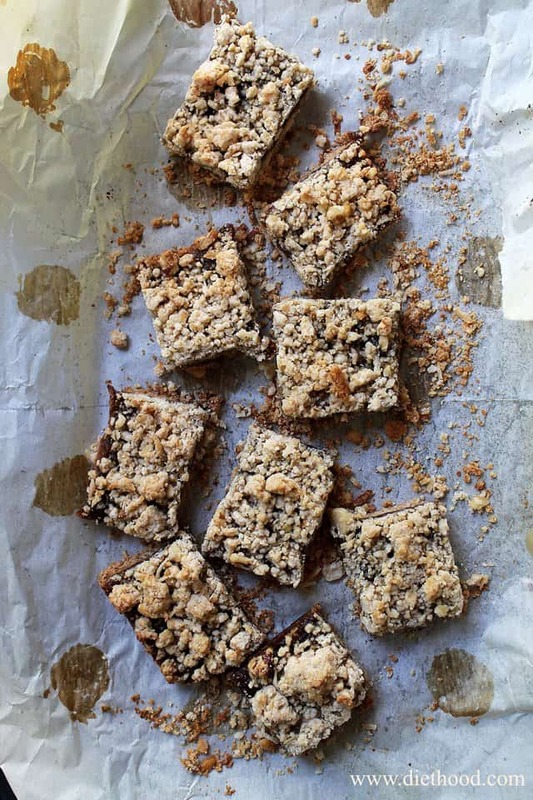 They are buttery and crumbly and delicious, and a great solution to my dilemma of what to do with all the jam my mom gave me! What is a stick of butter? Hi! That would be 113.4 grams or 8 tablespoons. I have no idea how my tall spouse and I fit on a queen–a couple of guesses are that we have lived in places where it was really hard to get the mattress and box spring up the stairs (jungle cat in previous life, must sleep above ground) so we’re hesitant to upgrade, or that he’s deployed so much it’s mostly me in the bed. I dunno. What I do know is that these bars remind me of my friend Lasar’s “Tasty Raspberry Treats” so I can tell you that the combination of raspberry jam, coconut, oats and other goodies is in fact delicious. If I could pry the fig jam away from the menage with the goat cheese and prosciutto, I’ll make these too. We’re on the same wavelength! Figs are definitely the “it” ingredient right now. 🙂 These bars look delish!! You’re 5’6! Could you lend me an inch or two? I’m tired of using step ladders for photos. 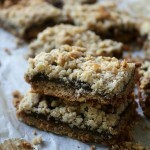 I love date bars and I love figs… so my guess is I would looooove these! Yes, you would! They are so good!! 🙂 Thank you, Charlie! 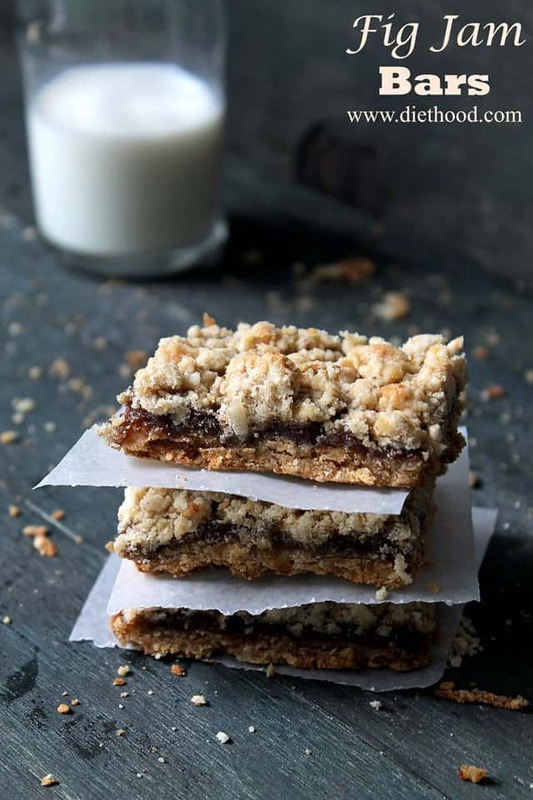 These fig jam bars look totally irresistible with that thick layer of streusel! I love bars! They are so yummy and easy to share. Never had fig jam before, but I can’t wait to try it. I so need these in my life, or belly but whatever! They look good! I didn’t know you were moving! Congrats! A pair of high heels (instead of yoga pants) might do the trick when the bill arrives… You’ll always have these stunning fig bars! Lol. These bars sure would help easing him into the sticker shock. It’s gonna be so much fun moving to your new home. Enjoy. Gorgeous, I need a couple three of these for breakfast. And I can’t wait for hoodies and yoga pants either!! Yum! Your bars look delicious!!! Love this recipe! Delicious and figs are one my favorite. Oh and your pics are just stunning, Kate! Beautiful! Wow this recipe looks so easy! I wouldn’t mind making these, the store bought ones I can’t stand, maybe with these I can convince the hubs to stop stocking them up from Sam’s Club lol. Hahaha! I love your reasoning for hubby that “it was for him” at 6’3″ on that king size bed you ordered. Mine is 6’5″. So, I hear ya! These bars? Oh my…I love everything figgy. They’re beautiful. Thanks for sharing, Kate! I can’t wait to make them. Great story, too. You may want to have a pan of these ready when hubs gets the bill!!! Please pass the pan! These are the kind of bars I can never stop eating so I’ll be joining you in the yoga pants/hoodies club ;).